The best tacos in Los Angeles? Hmmm, I could easily make a case that Leo's Taco Truck makes the best Al Pastor Taco in Los Angeles. And they certainly give you the best tasty value by charging just $1 per taco. Well, when you put it all together, for this Nocturnal Noshing Frugal Forager, I gotta give it up for Leo's -- they make my favorite taco in town. You can keep your grass-fed and hormone free, artisanal, hipster fusion tacos -- sometimes I just want one that tastes good. 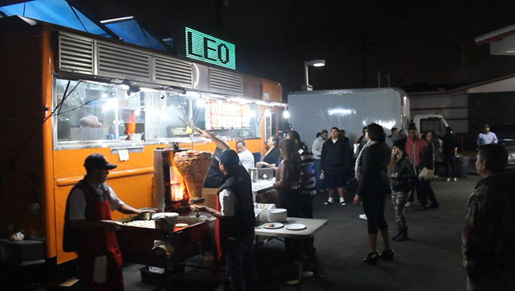 And Leo's Taco Truck (also known as Tacos Leo,) located in a gas station parking lot at La Brea Avenue and Venice Boulevard, does tacos right -- and I'm lucky to live just a couple of miles away. I've stopped there many times on the way home around midnight, after a double feature movie from the Cinefamily on Fairfax Avenue or the American Cinematheque on Hollywood Boulevard. If there is a line it moves quickly. At a table in front of the taco truck you order and pay just a dollar for the most tender and flavorful grilled marinated pork, that's cooked in front of a gas grill called a trompo. 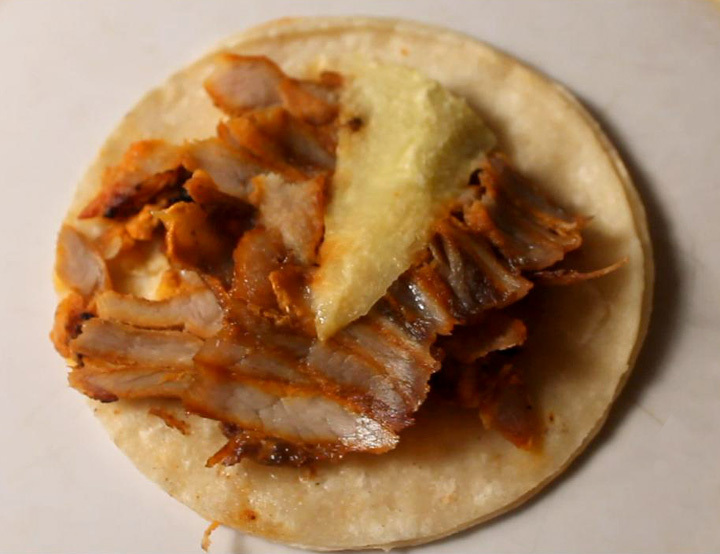 At the top of the inverted pyramid of orange chile stained pork is a haunch of fresh pineapple, that the cook, with a flick of the knife blade, skillfully hacks off a sliver and snags it in the tiny corn tortilla mitt loaded with thinly sliced pork. 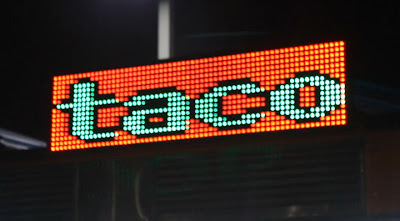 Once your name is called and handed the tacos, you can go to the salsa stall for green, red or avocado sauces. There is also chopped cilantro, sliced lime, radishes, and a spicy chile\onion slaw. But Leo's al pastor is so good you may not want to put anything on it and just savor the perfectly cooked and seasoned pork.. I've had Al Pastor all over town and this is the best. Most taquerias, that have a trompo of al pastor, cheat and slice off the marinated pork before it's cooked through -- so they end up grilling it on a flat top, which just dries out the meat. Plus you lose the open flame char taste. 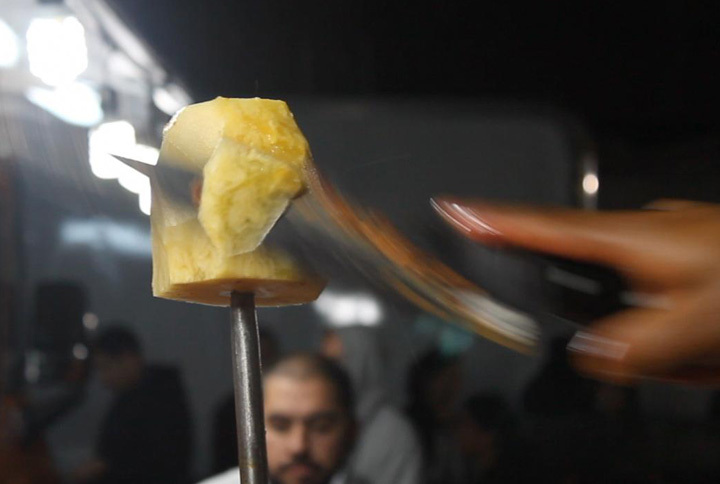 And often other taco trucks don't even bother with a hunk of pineapple to give the al pastor tacos a kick of sweet and sour citrus. There are plastic tables were you eat standing up. If you park around the corner on the parallel street off Venice Boulevard, then just chow down in your car. I order 2 or 3 tacos, topped with a minimum of salsa, chopped onion and cilantro -- I usually leave one taco unadorned, the better to enjoy the marinated grilled pork. Leo's Taco Truck also dishes out the usual Mexican fast food fare: burritos, tortas, quesadillas, etc. And various cuts of meat and offal, like: carnitas, carne asada, buche, tripas, chorizo and lengua. You can probably guess how Leo's Taco Truck rates on The 99 Cent Chef's Cheap$kate Dining scale of 1 to 9, 9 being best. Just watch the video below to see the delicious footage and rating. Play it here, video runs 2 minutes, 24 seconds. 99 thanks to Bob McGuinness & neighbor Pete for their camerawork. Taco Madness curated by L.A. Taco is on! Vote for you favorite Los Angeles Taco by clicking here.